Six tiny tile cameras in one awesome iPhone app. 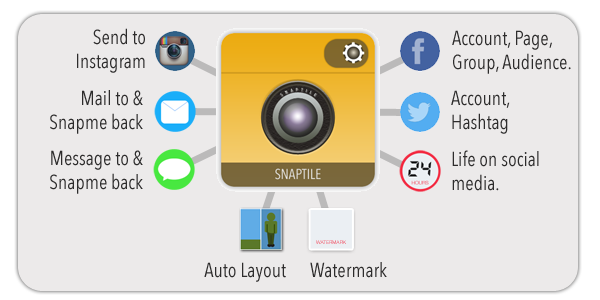 A Snaptile is a new type of hybrid photo message designed especially for the iPhone & social media era. It is compact, disposable, informative and creative. Sized perfectly to make the best impact on social media and save precious bandwidth, a Snaptile is a new way to communicate over your existing social media channels. It lets you say more with less. 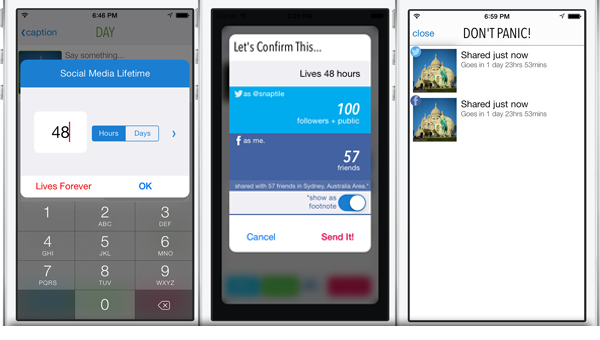 Making it much easier to share safely, Snaptiles can do all sorts of things, from self destructing on Facebook & Twitter to making your Instagram photos really stand out. Check out the Snaptileography page for some creative examples. Each camera can be set up with its own sharing options. This means that you don't have to think about where you are sharing a photo. Just pick the right camera for the job. only share with family members on Facebook. share photos that always exclude a set of "friends" on Facebook and then disappear after 48 hours. send to your company Facebook page & company Twitter account, even with an automatic watermark. share photos directly into your Twitter timeline and then make them disappear after 7 days, tidying up your public profile for you. iMessage your partner with animated GIF selfiegrams of where you are and let them snap you back directly from the message. email a group photos of things that you want to spotlight. let you fit a full sized photo into an Instagram shot. Choose from five live camera layouts. You can pre-set by camera or choose when you take a photo. 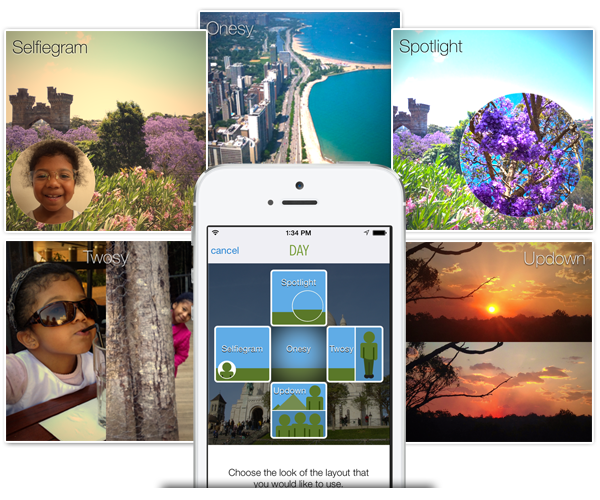 Each layout lets you shoot directly into the layout or choose an existing photo from your photo reel. Selfiegram is optimised for the next level in selfies. It lets you shoot the background with the main camera and then auto switches to the front camera. It even zooms in and prompts you to look up, helping you get an optimal selfie every time. If sharing selfies by iMessage or email, you can even use 'wobble' mode which animates the selfie part of the photo and keeps the background static. A simple three step process lets you tell the full story. A selection of unique filters, frames & effects let you create a striking image. Automatic Facebook place detection not only works off your live photo, but any older photos from your photo reel. This comes in very handy when you snapped something with your iPhone camera earlier and are now sitting in a cafe five miles away. You can even say which of your Facebook friends you were with. You can complete the story by adding a title or some text and even add a photo mark with the location, time, date and current weather. Finally, for the fanciest travel pics, you can even stamp an image of the globe with your location pinned to it. Snaptile makes it really easy to see where your photo's going, set how long it's going to be there and, remove it if you had a sudden change of mind. In addition to the default share settings for each camera, you can also change your audience, and the photo's life on social media photo by photo. By enabling Snap Nanny, you also get a bit of help in seeing just how many people will be able to see the photo you are sharing. Snap Nanny also lets you setup a danger zone, which is a time of day that you might need a little extra confirmation before you press send. Just to make sure you are of sound mind. Finally, a PANIC button lets you erase the last 12 hours or last 30 minutes photos. You can even select by photo and change to remove straight away, or keep the photo forever. 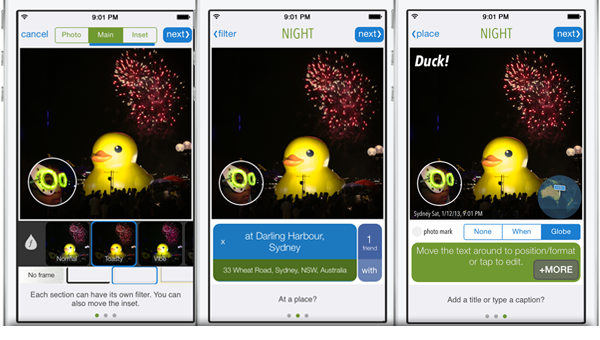 The idea behind Snaptile is to be able to safely say more using less. Imagine not only helping save resources, but cleaning up your past profile as you go and not boring your friends to death with torturous multi photo posts that no-one ever looks at anyway. The slide night was never fun. Ask your parents. Snaptiles are very space efficient. They are 5-10% of the size of a standard photo. 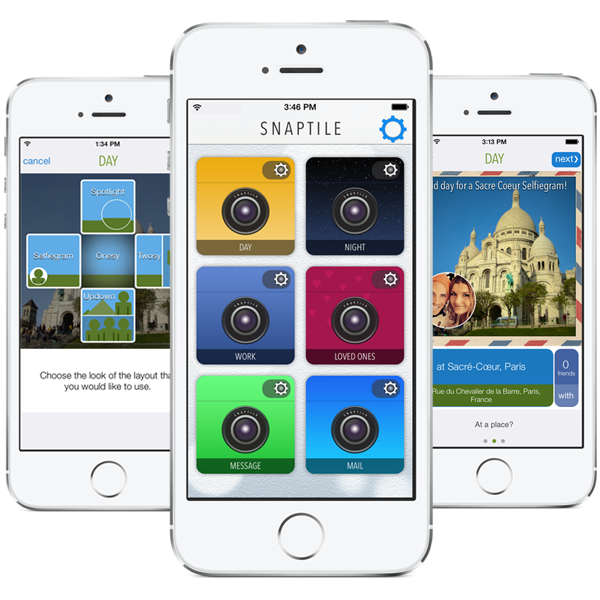 That means for every 1 normal photo, you can store 10-20 Snaptiles. They are optimised to fit nicely in your Facebook/Twitter/Instagram feed without clicking. You can get your whole message across in one photo. The combination of multi photo layout, title/caption, photomark, weather and even where you on the globe means you've said it all. Your audience will love you for it!